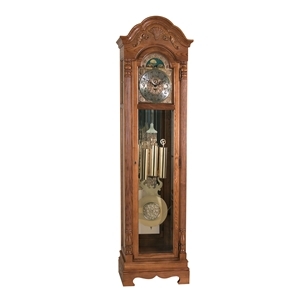 This traditional design with gently curved solid bonnet and graceful shell and leaf overlay on the crown comes with a Treasure Oak finish on select hardwood solids and veneers. Reeded columns with upper and lower turned caps frame the dial. Through the beveled glass of the front locking door and side glass panels, brass finished weights shells and a lyre pendulum with matching decorative 10 5/8” (270mm) disk, hang beautifully in front of a mirrored back.